I'm totally not that person who bakes instead of searches for necessary receipts for the impending tax season (insert scary music here). Nope, not me at all. Nor am I that person who bakes instead of calls someone to fix my leaky washing machine and hurting computer (hang in there old pal). I'm so not that person who has procrastination issues. Nope, not me at all. I'm just rather fond of baking. Really. And while the world at times feels like it's closing in on me, hot damn I've got good muffins and a PVR full of episodes of GIRLS and Veep to keep me company. I'll pull the blanket off my head when I'm good and ready. But not just yet. The tax man can wait. 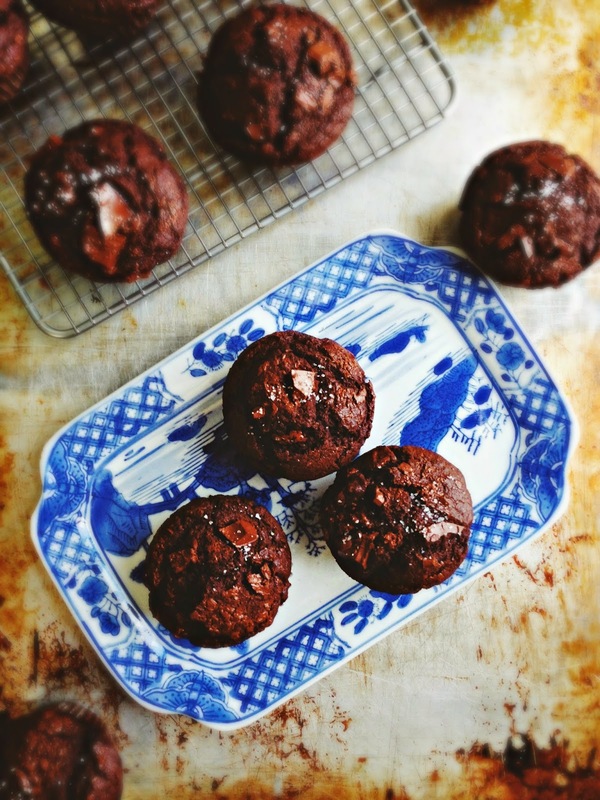 Dark chocolate and rye flour seems an odd combination to me - and maybe to you too. 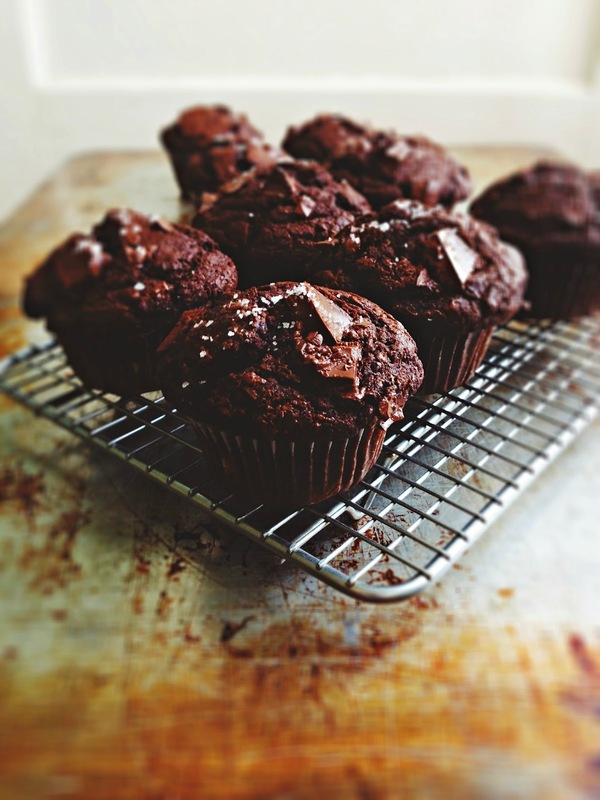 But believe me, these muffins are friggin fantastic. And good for you! The list of ingredients deserves a good glance over. Rye and spelt flours are high fibre and good for you. Cocoa and dark chocolate are excellent antioxidants. 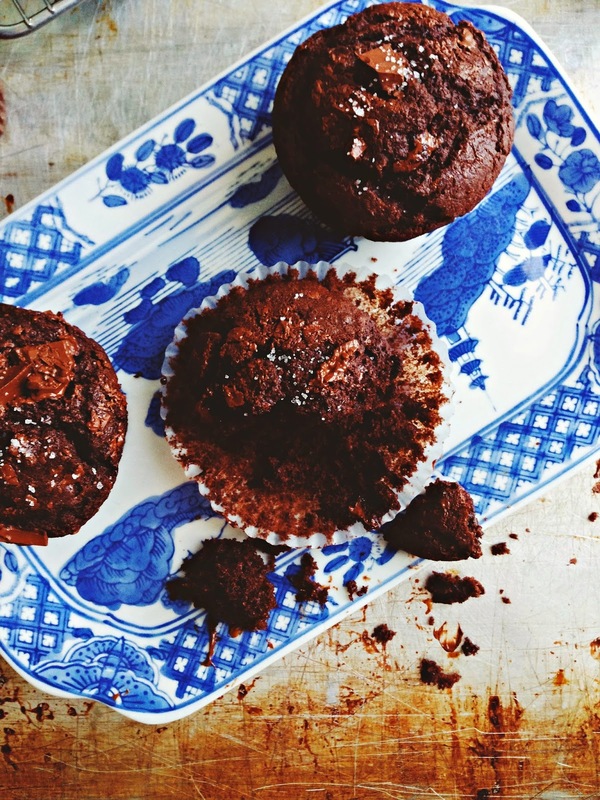 Coconut milk means these muffins are dairy free. 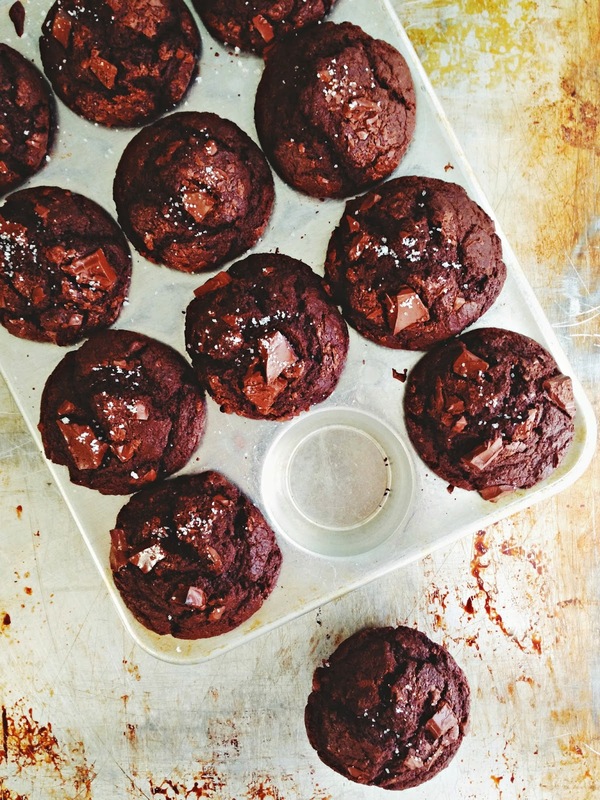 I like the fruity, earthy taste olive oil gives to baking - it seems to go well with chocolate, too. And because there is just a little maple syrup and mashed banana action means these muffins are not too sweet and yet indulgent. Chunks of good chocolate melt into little puddles, a highly desirable quality when biting into one while still warm. Don't forget the light sprinkling of fleur de sel. That dark chocolate/sea salt combo never gets old. Also, there are just mere hours (hours!) left of this dastardly winter. I don't know about you, but I can't wait to stomp around in my rubber boots and and watch the last of the snow melt away. Maybe a good ol' puddle jump is just what I need to chase away the procrastination issues lagging about. You know, if I had any. Which I don't. I just really like to bake. Line muffin tin with papers, or grease well. In a large bowl, combine all dry ingredients and whisk well to combine. In a separate bowl, beat the eggs until light, about 1 minute. Whisk in the coconut milk, maple syrup, mashed banana, olive oil and vanilla. Stir the wet mixture into the dry, then stir in half the chopped chocolate, being careful not to over mix. Scoop the mixture into muffin cups. Sprinkle remaining chopped chocolate on top and bake for 18 - 20 minutes, until a toothpick comes out clean. Sprinkle with fleur de sel while still hot. Makes 1 dozen muffins. Puddle jumping is not necessary for me to bake these in my own kitchen Renee. 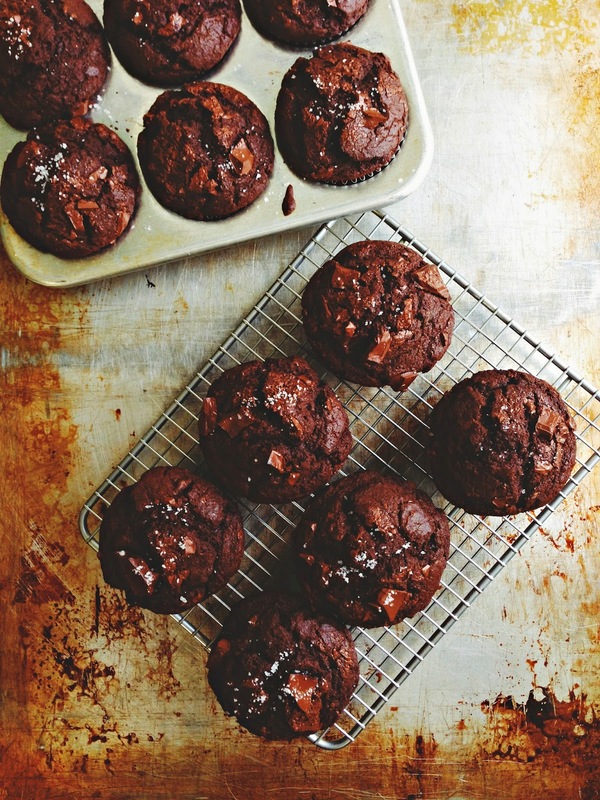 These muffins look devilishly delicious. All that deep dark cocoa and chunks. Pinning this to make at a later date. So lovely! Never would have thought of the rye chocolate combination! Val - These are great muffins! Jess - Long live the procrastinators!